Learn more about the Lorex HD Surveillance System with 4 Audio-Enabled Security Cameras. Get pricing, and answers to common questions. 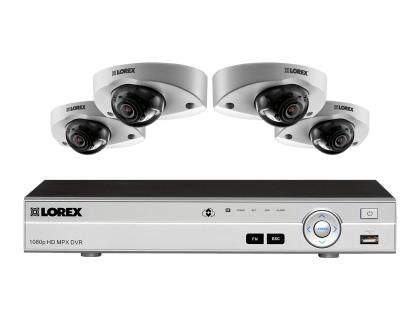 The Lorex HD Surveillance System with 4 Audio-Enabled Security Cameras is designed around an eight-channel digital video recorder (DVR), which supports 1080p HD recording on all channels. This Lorex security system comes with listen-in audio capability. Includes 4 audio-enabled 1080P cameras. Pros: Vandal-proof with an IK10 rating, and can be installed against low walls. Cons: Mobile apps problematic at times. Bottomline: Complete security system for your business that can withstand all weather conditions. What are some alternatives to the Lorex HD Surveillance System with 4 Audio-Enabled Security Cameras? Where can I buy the Lorex HD Surveillance System with 4 Audio-Enabled Security Cameras? The Lorex HD Surveillance System with 4 Audio-Enabled Security Cameras is available via Amazon and the Lorex website. Does the Lorex HD Surveillance System with 4 Audio-Enabled Security Cameras work at night? Yes, it has very good night vision capabilities. Each of its LEV2750AB security cameras has ten infrared (IR) LEDs, and a night-vision range of up to 90 ft. in ambient lighting, and 60 ft. in total darkness. This solution has SmartIR technology to compensate brightness for close-up objects, and split-glass design that minimizes IR reflection. Can the Lorex HD Surveillance System with 4 Audio-Enabled Security Cameras be used in any weather? Yes. The Lorex HD Surveillance System with 4 Audio-Enabled Security Cameras has weatherproof cameras. These IP66-rated cameras can endure inclement weather and function in temperatures between -22 °F and 140 °F.